a watch, a coin, a shiny thing. Afterward she'd crawl ... "
Two creatures live in the house. 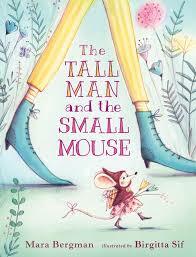 The tall man does not know about the small mouse; the small mouse has no knowledge of the tall man's presence. The tall man spends his days doing what tall men do - picking apples, untangling swings, rescuing cats and kites from trees. The small mouse sleeps and creeps, then spends her time finding pins, pegs, corks and other very special things. The tall man sets himself a task to fix the town clock. But no matter what he tries, he cannot do it. He cannot find a way to fix it, despite much research. Tired, he goes to sleep. While he is sleeping, the small mouse does her thing, and then settles into a nearby pair of shoes for a long night's slumber. In the morning, the tall man is preparing for the day when he tries putting on his shoes, disturbing the small mouse and scaring himself. He also discovers where so many of the little treasures he needs for his fixing work have gone. Perhaps the mouse can help him with the town's clock. It seems two heads are better than one. Engaging text that sings with rhyme and rhythm is accompanied by Birgitta Sif's signature charming images, created in pencil and then digitally colored. 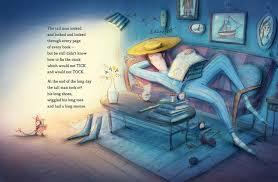 They are as warm and gentle as the story, and assure a lovely read at bedtime, or any time of the day. What do the two friends do all day?